Our company LEGAL INFOSOLUTIONS PVT. 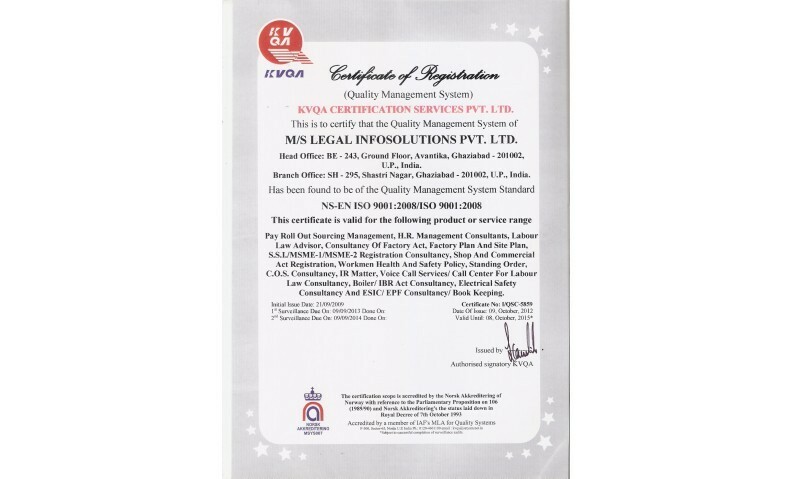 LTD. is the first ISO-9001:2008 CERTIFIED company in India in our category of services. LIPL is a leading HR Company focusing on Statutory Compliance for Establishments, Factories, besides Payroll Compliance, Contract Labour Compliance, Consulting and Audit, Flexi Staffing and Payroll Services. We have expertise in Labour Laws applicable to various States and offer services on Pan-India basis with our own resource and infrastructure supported with in-house technology. Our distinguished list of clientele speaks for our capabilities and competencies. LegalIPL as established in the year 2001 and since then we have grown substantially by catering to a wide client base. Our success is a result of the mentoring and proficient skills of the CMD, Mr. SATENDRA SINGH, a visionary legal professional with more than 15 years of experience in handling different cases. Our associate lawyers are graduate and postgraduate degrees in law & have thorough knowledge of the Indian laws and are well-versed & possess with the intricacies involved in various legal procedures and offer client-friendly services inspired by the vision of our respected CMD. The Para-Legal and back up staff are also efficient and competent with sound law background. Equipped with the latest technology, we ensure that our attorneys have continuous access to reference materials, judicial precedents, and computerized resources including the Internet. We believe in the value of traditional service. We affirm to provide service to every client through close personal attention, from flexible and highly skilled teams. We aim to provide outstanding services to our clients combining our in knowledge, skills and experience to suit to their needs and demands. Further, we know well, how to deliver this and at the same time meet the changing demands of a complex world. Understanding transition from traditional practice due to liberalization and to help the clients to find satisfactory solutions is the goal in our approach. We work with an objective of providing the ultimate satisfaction to the clients by dealing ethically in our endeavors.Our aim is to save the clients from any legal hassles and provide solutions for all types of legal problems under one roof. We have managed to establish long term relationships with many clients based on trust and integrity and our successful representations have resulted in the addition of many prestigious names to our client list . The Firm has offices in U.P. and operates through associate offices in Delhi and NCR. LIPL is a Labour Law Compliance Outsourcing venture of LEGALIPL Consulting Group. It offers one-stop compliance solution for all your labour law obligations – be it registration / licenses / approvals, depository, register & record maintenance, statutory displays, periodical returns and other departmental submissions. Having pan- India presence, it operates through its branches at Ghaziabad, Noida. LegalIPL was established in the year 2001 and since then we have grown substantially by catering to a wide client base. Our success is a result of the mentoring and proficient skills of the CMD, Mr. SATENDRA SINGH, a visionary legal professional with more than 11 years of experience in handling different cases. Our associate lawyers are graduate and postgraduate degrees in law & have thorough knowledge of the Indian laws and are well-versed & possess with the intricacies involved in various legal procedures and offer client-friendly services inspired by the vision of our respected CMD. The Para-Legal and back up staff are also efficient and competent with sound law background. Equipped with the latest technology, we ensure that our attorneys have continuous access to reference materials, judicial precedents, and computerized resources including the Internet. We believe in the value of traditional service. We affirm to provide service to every client through close personal attention, from flexible and highly skilled teams. We aim to provide outstanding services to our clients combining our in knowledge, skills and experience to suit to their needs and demands.